Fritatta, Spanish tortilla, flat omelet–whatever you want to call a skillet of beaten eggs baked with stuff–this is my favorite dish to serve last minute guests. Brother and his friends stopping by on their way through town? Potluck to attend? Fridge looking nearly empty? If there are eggs, you can make a fritatta. Here’s how I do it. Look at what’s on hand and gather some ingredients: potatoes, greens or parsley, cheese, eggs, olive oil. Heat the oven to 375°F. Pour about 1/8 inch of olive oil into a cast iron skillet. Coat the sides with some of the oil. Thinly slice the potatoes, lay them in the skillet, and put it in the oven. Now you have some time to fix your hair or wash the dishes while the potatoes soften. Check them after 15 minutes. Take the pan out of the oven when the potatoes are fork-tender but firm. Chop up the parsley or greens (unless you’re using salad mix or baby greens), then scatter it over the potatoes. Shred or crumble a cup or so of cheese and sprinkle that on. Beat some eggs (I use about 8 for a ten inch pan) with a little salt and pepper, and a splash of milk or cream if you want. Pour the eggs over everything. I like to sprinkle a little more cheese on top. Bake this until the eggs are nearly set, but a little wiggly in the middle. If it seems like it’s taking forever, turn the oven up to broil. Cool for a few minutes before slicing. 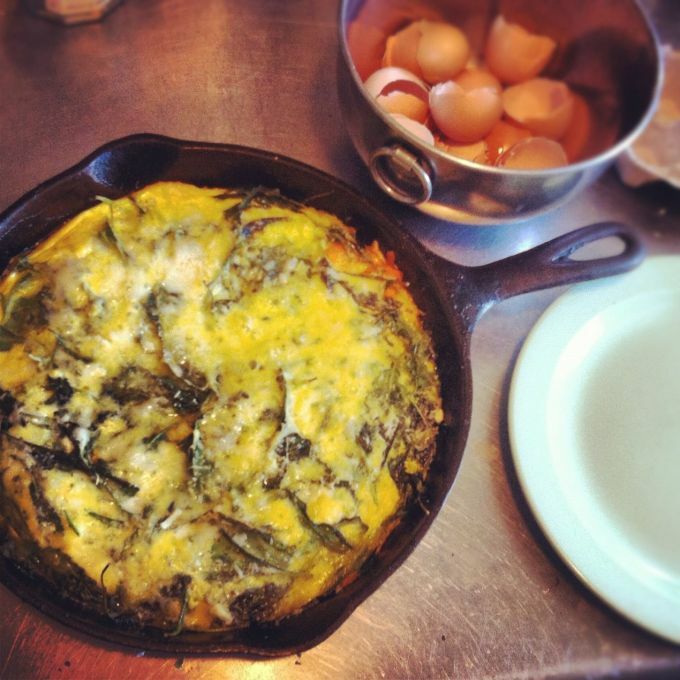 You can serve frittata warm or at room temperature. It’s fine to make it hours ahead. I like to set out salt & pepper, hot sauce, and fancy ketchup and let everyone season their slice of fritatta as they like. Pantry really really bare? Just onions and dried herbs will do, especially if you have a sprinkle of parmesan for the top. Just sauté sliced onion in the pan until translucent before adding anything else. Mix the herbs into the beaten eggs. Proceed as above. You could also add leftover cooked vegetables instead of greens, or stew some canned tomatoes in the pan for a few minutes with sautéed onions. It’s hard to go wrong. And the leftovers make great sandwiches.